I was heading to the Henry Ford Museum strictly as a tourist until I chatted with Kate Lawson, Food Writer for The Detroit News. She suggested that I reach out to Jesse Eisenhuth, the Director of food and catering for the museum. When I got to the museum Jesse sat down and shared the vision he and Head Chef Mike Trombley have for the culinary program. 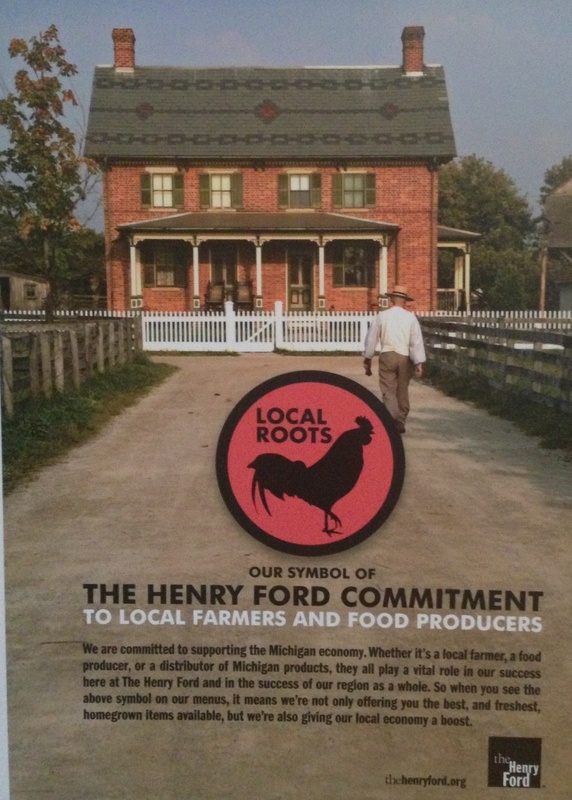 The museum is committed to its “Local Roots” program which has them working with neighboring Michigan farms and communities to procure their food products. Their commitment goes beyond just trying to find the best ingredients, they are dedicated to working locally to help support and stimulate the local economy. When I asked Jesse what “Local” meant to him he said they focus on purchasing products that are grown in their natural state, take chickens as an example, they only purchase free range chickens raised in the way that they were intended. 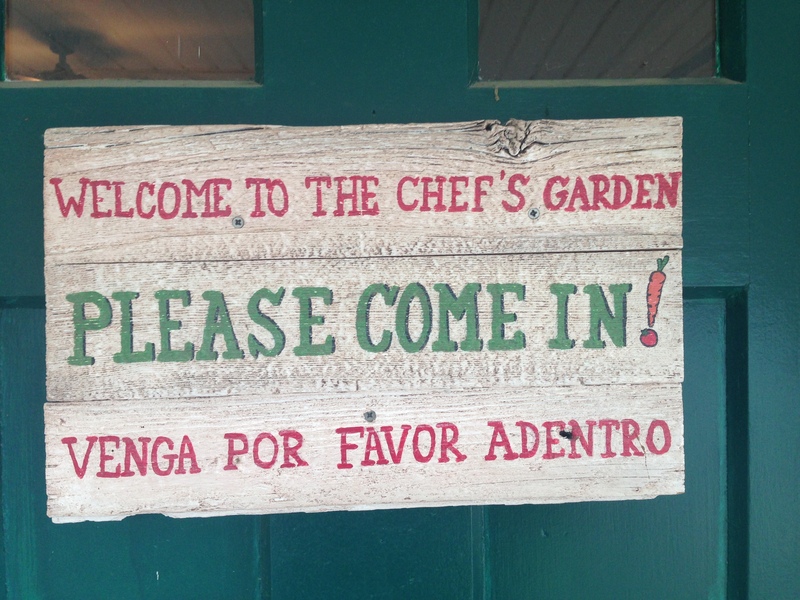 You can look around the food venues and see local everywhere, they even moved to local coffee and bottled water. This commitment to food has taken pre-packed and pre-made foods or “freezer pleasers” off of their menu and replaced them with food made from scratch as often as possible. The food has gone from canned and boxed foods to soups made from homemade stock and mac n’ cheese made with real Michigan milk and cheese. There are always healthier options offered but even the more caloric meals are still made with the best ingredients possible, while not making it necessarily healthy it definitely is a benefit to consume real cheese vs. a powdered cheese substitute. Both Jesse and Chef Mike have their work cut out for them. They are providing food not only for the guests of the museum but they are also responsible for feeding high schoolers at the onsite college prep charter school the Henry Ford Academy as well as employees of the museum. 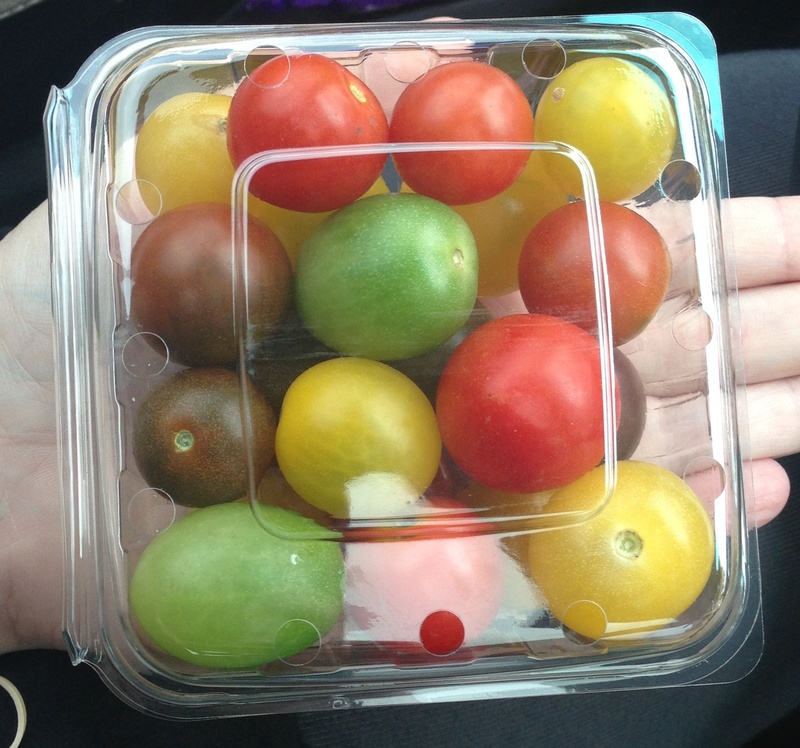 They both believe that it is important to provide all on their grounds access to quality healthy food. We hopped on a four wheeler to tour Greenfield Village, the 80 acres that are set behind the main museum. 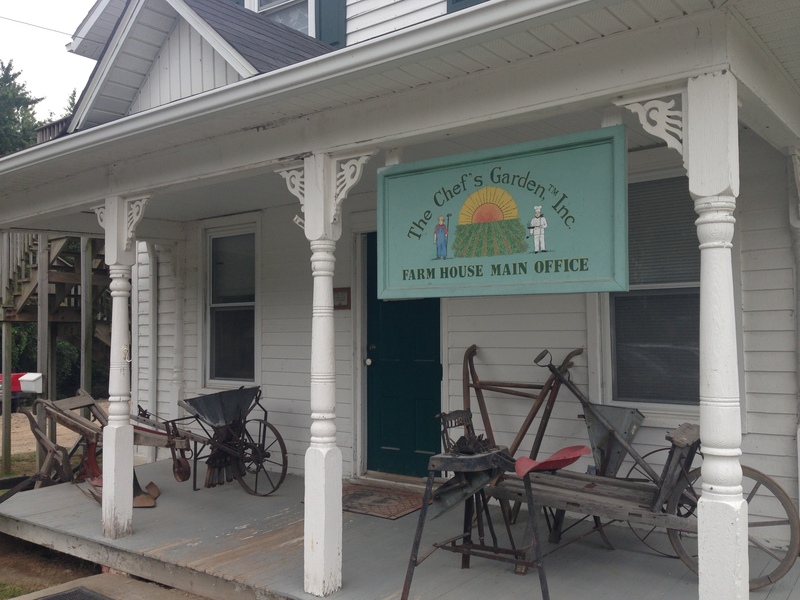 What started as Henry Ford’s personal collection has turned into a small town where you can step into the past and tour unique buildings like Thomas Edison’s Shop. The commitment to Local Roots and quality food continues on the streets of this village. 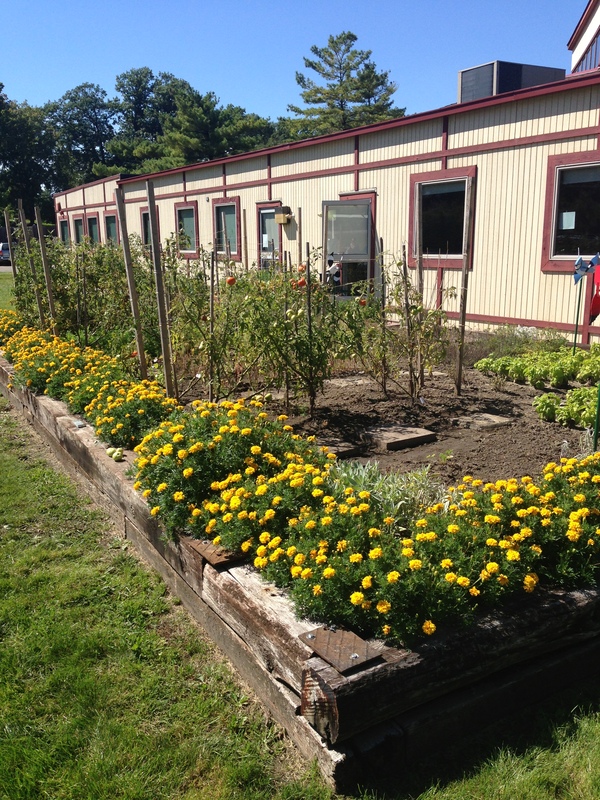 Just outside of one of the high school buildings there is a herb garden that is harvested by volunteers for use in the food program at the museum, additionally there is a working farm in the village that produces even more food. 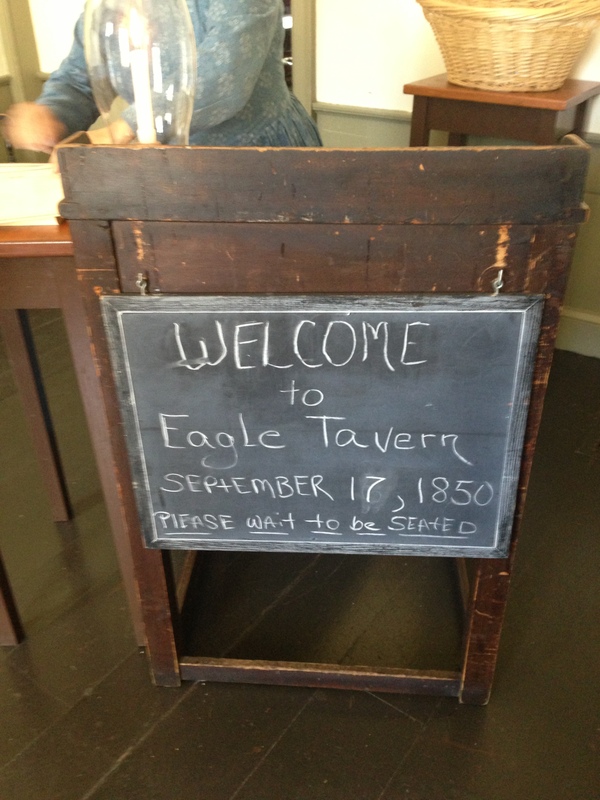 Jesse and I stepped into the Eagle Tavern, the actual original tavern from back in the 1800’s which was purchased by Ford, taken apart and rebuilt within the village. The year was 1850, we were greeted by staff wearing period clothing and were presented with a menu filled with meals created with ingredients found in Michigan during that time. I am not one for LARP (Live Action Role Play) but this was done quite well, and let’s be honest I am a child of the 80’s, I have forever dreamed of taking a stroll through the small town of Walnut Grove, the location of the books and television show “Little House on the Prairie” as Laura Ingalls Wilder or “Half-Pint” as some of you know her. We sat down to a table lit with a candle and were handed an extensive menu. We dined on chicken corn chowder and pan seared trout, and finished our meal with a strawberry shortcake, it was all absolutely amazing! Perhaps this is why “Losing Weight Off the Interstate” has proven to be so difficult. 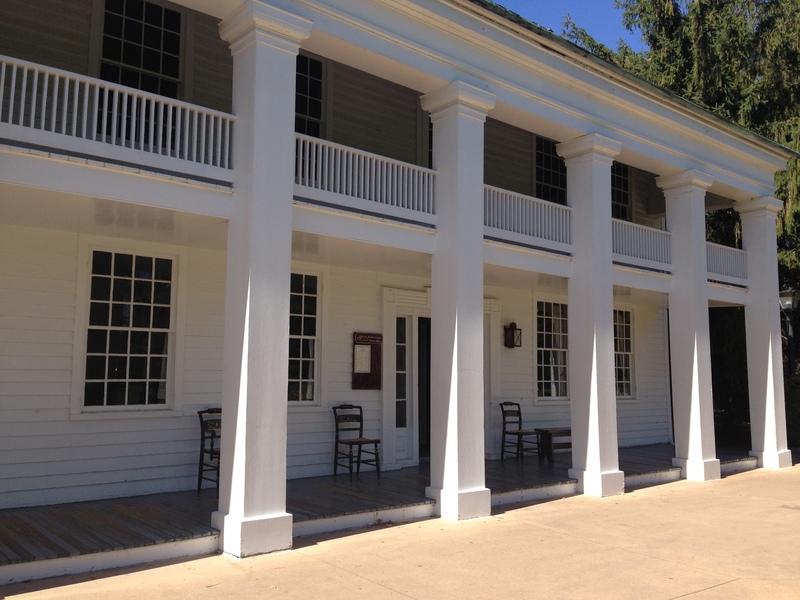 Jesse told me that The Eagle Tavern has consistently been chosen as one of the top restaurants in the area which is an even bigger feat when you realize that you must pay the entrance fee to the museum to dine there. One of the most interesting things to me was that while the costs to prepare high quality food were higher than the other canned variety the museum was serving previously the costs weren’t necessarily passed on to the consumer. 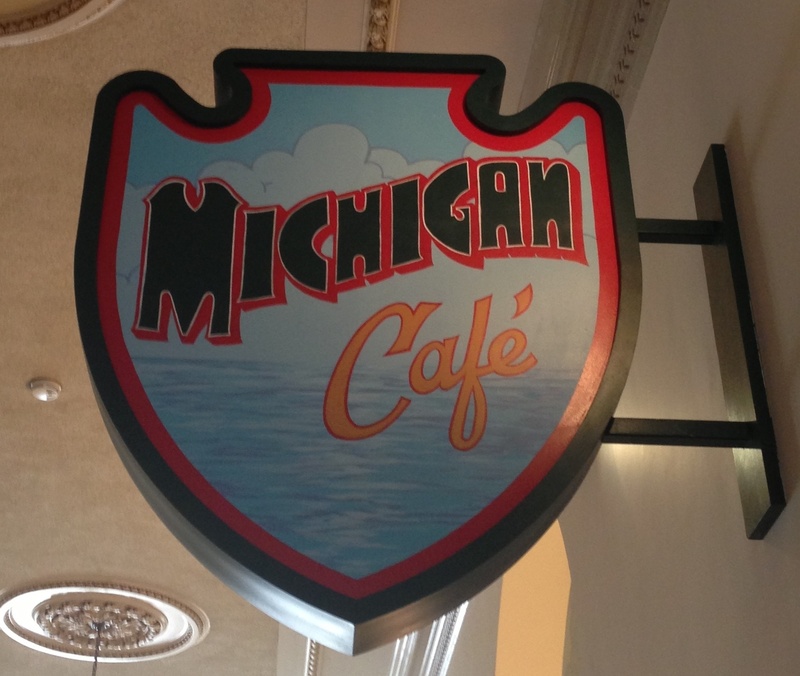 The price point for a warm lunch at the Michigan Cafe hovered right around $7.00, to me this was an incredible deal. Jesse indicated that they weren’t looking to make money off the food program, they wanted to keep the price points low enough that the visiting families could afford to eat onsite. Remembering a $25 meal the last time I ate a cold burger and fries at Disney World I was shocked, and pleased. It is really refreshing to meet people who are really passionate about providing quality food and economic opportunity to their customers and community. There are plenty of places that I visit that I have no connection to, and no leads to food and fitness experts. When I was in Detroit I realized that I had nothing, just warnings from everyone who had heard I was going there bouncing around in my head. I spent my first evening in my hotel room, too scared to go out after dark, and researching people in the area who might be of interest to speak with. 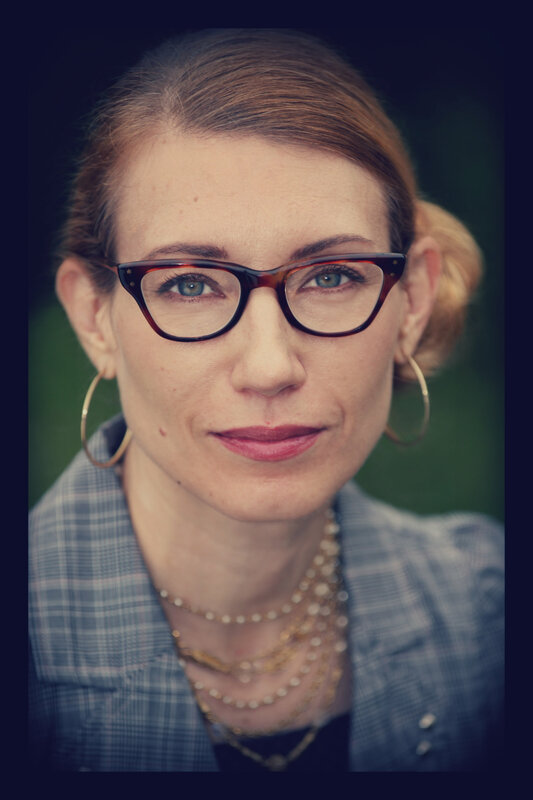 During my research I came across the Food writer for the Detroit News, Kate Lawson. 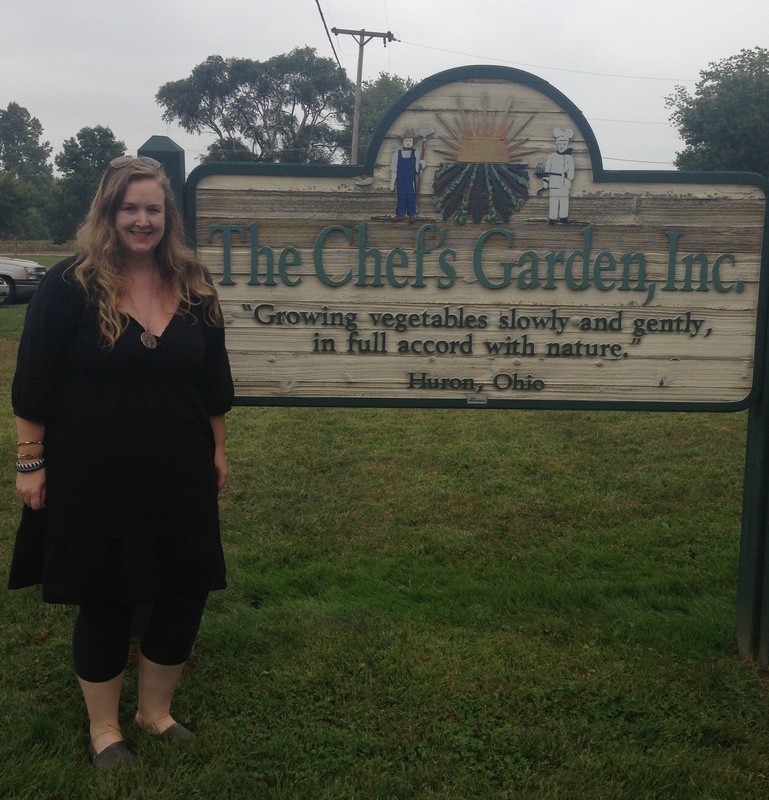 Kate writes several food columns covering everything from cooking trends to local professional chefs. It was last minute, I felt guilty as I hit send on my email requesting to chat with her about the local food scene. The next morning as I was preparing for my day my phone rang, a very strange sound since most of my communication is via email and text. Upon answering I was met with the friendly voice of Kate Lawson. Luckily for me it wasn’t just her voice that was friendly Kate was so excited and supportive of my journey and eager to meet with me to chat. 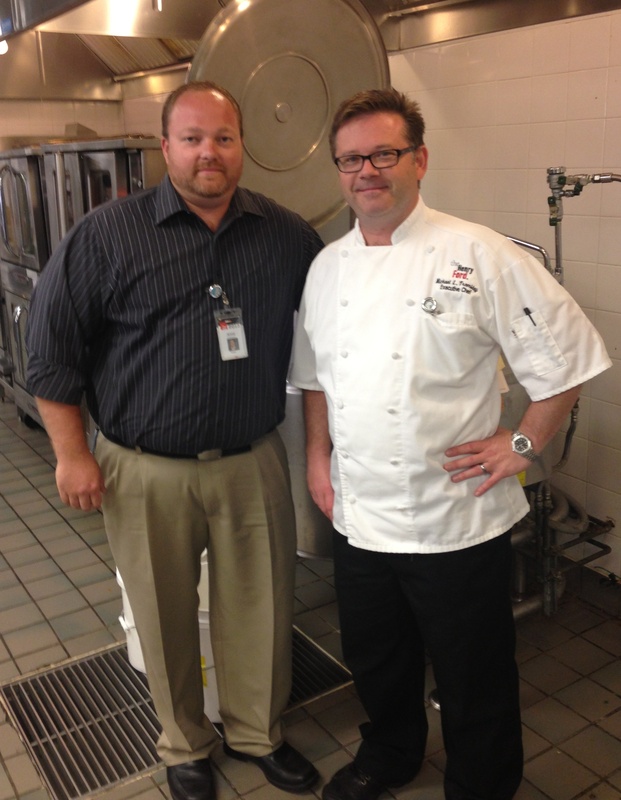 When I told her I was headed out to the Henry Ford Museum in Dearborn she encouraged me to reach out to Jesse Eisenhuth the Director of their food service and catering. This turned out to be a wonderful suggestion and I ended up spending several hours over the following two days with Jesse, learning about their approach to food. I can’t go into too much detail as I am busy writing a blog post about that experience, so sorry, you will have to wait. Kate and I made a plan to have lunch and a tour of the Detroit area, she picked me up at my hotel and within moments of being in her car I knew I had connected with the right lady. If she had provided me with nothing it would have been just fine with me because every moment with Kate was a good time. I felt as if I had known her for years, conversation was easy and the afternoon enjoyable. We went to a small restaurant in Mexicantown for an authentic taco lunch followed by a visit to a popular deli called Mudgie’s, located in a hip brick building in the historic Corktown neighborhood for dessert. Yes, we had dessert, though we had a small lunch in anticipation of this move. We shared the decadent “Sweet Ruth” which is a homemade bread pudding apple waffle cooked to order and topped with amazing horchata ice cream and butterscotch caramel. I can justify this because this divine desert was made with local ice cream and caramel sauce, ok a bit of a stretch but at least it was a high quality freshly made choice. We finished our tour with a stop by the Detroit Mercantile, a well merchandised store filled with so many amazing things including an owner who used to live in Spokane (my hometown) and had only good things to say! Win win! Kate had to get back to work so she dropped me off at my hotel. We said our goodbyes had a nice hug and Kate told me she thought I was “Berries”, which I have never heard before but am going to assume is a good thing. In regards to all the scary things I heard about Detroit, I am confused, I found Detroit to be a cool city. I don’t know all the politics around its economy but I do know that the downtown core has plenty of charm and friendly people. Given the chance I would return again! I have never been to a therapist. I am sure many of you are reading this and thinking, aha, that is what’s wrong with her! I just have never felt the need to seek therapy, though in reality I think it is probably good for everyone. The thought of telling a complete stranger my deepest feelings and having them analyze me has never been appealing. Lucky for me, my good friend Julie Wilson just completed her masters of arts in psychotherapy from Seattle University. We chatted before I departed and she suggested that while she couldn’t act as my therapist officially that it might be helpful to have her on my team to aide me through some of the things that pop up on this journey. The funny thing about Julie not being my therapist is I feel like she already has been for the past few years, I mean aren’t most of our friends like therapists? Anyway, I think that it is always helpful to have someone you can bounce ideas off of and I would be happy to have a weekly scheduled call with a friend. We video chatted for the first time last week and she already has made some interesting observations. I don’t spend a lot of time thinking about my behaviors; why they exist and what they mean. Julie told me that some of my current behaviors are in conflict with one another. On one hand, I am most comfortable when I am in control of a situation, I like being in control, but I am not controlling. Interesting, and I can agree with this observation. The conflict comes when I quit my job, hop in a car and drive across country, stopping here and there, staying in people’s homes and not knowing what my next day is going to bring. I essentially have given up control for this trip. I don’t know what that means. I don’t know if I will find out and I definitely don’t know if I will ever share with you if I do find out. I can’t tell you how much I will be sharing of these self discoveries, it will most likely be pretty private but I am open to share when I can and I am super excited to add Julie to my supportive team. Julie is just building her practice, South Lake Union Therapy, and will be offering both individual and group therapy sessions. Check out her website, her small group offerings and like her on Facebook. Do it now! Oh wait, I guess I am controlling. When I told one of the Executives at my last Company what I was doing he was wildly supportive, in fact everyone has been supportive, what a lucky lady I am! Shortly after I went public with my idea he approached me to tell me that his parents were excited about my journey and wanted to host me in Dowagiac, Michigan. Where? I had never heard of this town which didn’t mean much because I had never even been to Michigan, it turns out it is a tiny town with a big personality. Thelda and Fred Mathews welcomed me with open arms into their home. They had activities planned for the entirety of my trip beginning with a cook out at their son’s home down the road. The next day was followed by a tour of the local community college, Southwestern Michigan College which Fred played a major role in founding in 1964. The facilities were incredibly impressive complete with a huge well equipped gym and a climbing wall. I have never liked climbing. I don’t know which is more painful, gripping on to the side of an object with just my fingertips or wearing that unflattering harness. I hate that harness look so much that if I had to climb I might even consider risking my life to climb without those unflattering straps. Back to the tour…after my morning at the College, Fred passed the baton off to Thelda who gave me a art tour around town. As the Chair of the local fine arts festival Thelda has been incredibly instrumental in getting sculptures placed throughout town. She has done such a good job that they dedicated the 14th sculpture in town, “Solitude” by artist Tuck Langland to her. Due to her work with sculpture the Mathews have become good friends with sculptor Tuck Langland and his wife Janice. We were able to join them in their home for a tour of Tuck’s studio prior to heading to dinner at Notre Dame. The studio was amazing, to take a step into a working sculpting studio was incredibly inspiring. 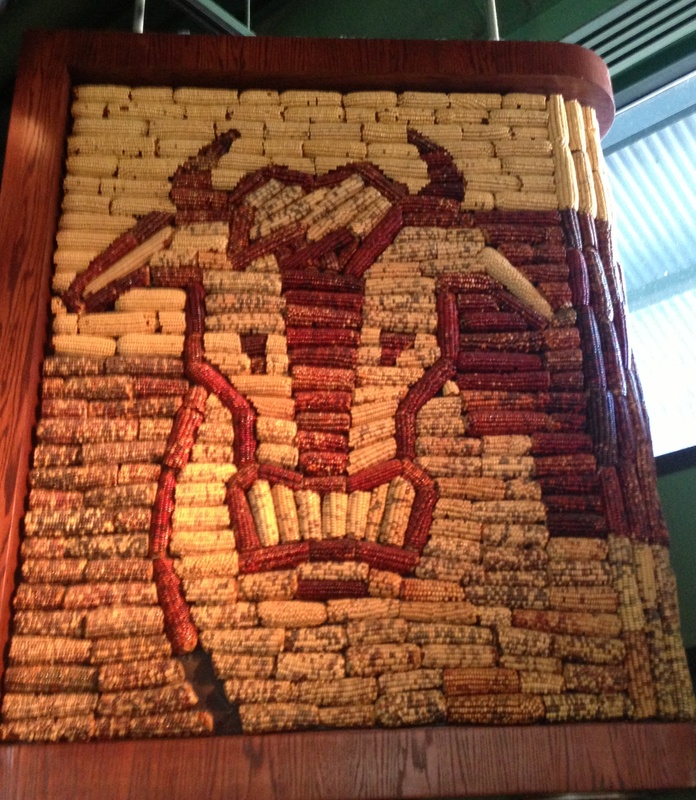 The talent was visible in every nook and cranny, finished and unfinished pieces alike showcasing Tuck’s skill. I have never truly tried to sculpt anything beyond my years in Play Doh but I wanted to dive my hands into that clay, however, I didn’t want to embarrass myself and our dinner bell aka reservations were calling. I had little knowledge of my exact location and was surprised when they told me we were going to be dining at Notre Dame. Notre Dame? Like THE Notre Dame? Clueless. Any confusion was cleared up as we drove onto campus and I saw the infamous golden dome. I had an amazing time being introduced to the “Center of the Universe” as the Mathews often referred to Dowagiac and am thankful to my hosts and my time spent there. It is always wonderful to meet new people doing cool things within their community. I also left with new friends and my heart swelled when Fred told me to call if I got into trouble, they would come to me if I needed them. Such wonderful people. I sadly didn’t take pictures while I was visiting Dowagiac, not sure how I missed that important step. 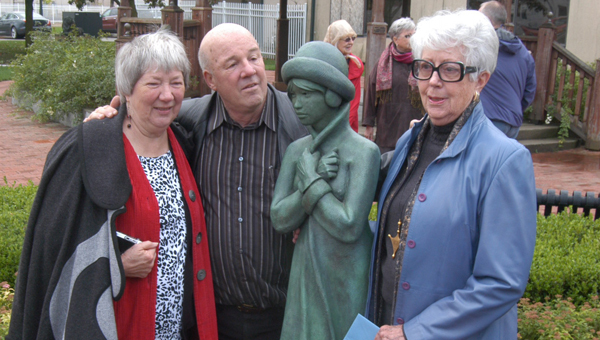 Below is an image taken from the dedication of the sculpture (from left to right Janice, Tuck and Thelda).